Daily Mirror - Violence in Ampara: Who is giving a free rein to bigots ? Violence in Ampara: Who is giving a free rein to bigots ? Last week, there was a fresh round of ethnically motivated violence in Ampara. Suspicion that led to unrest was as real as black magic is. 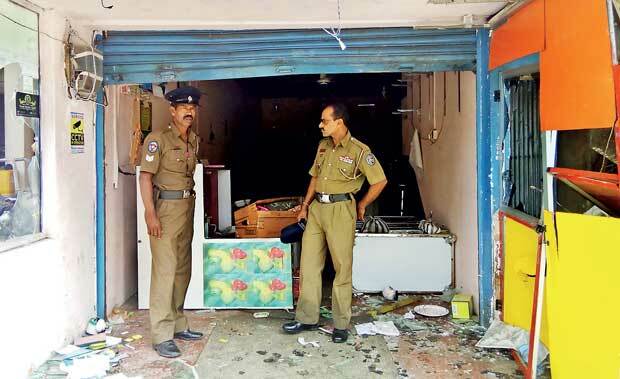 A group of drunken youth had stormed a Muslim owned eatery in the town and forced the cashier to confess selling food laced with male sterilizing chemicals. (A video of a confused man mumbling something when the aggressors asked whether the shop was mixing ‘vandapethi’ with food was then posted on a social media page run by a fringe Buddhist nationalist group.) The incident led to attacks on several Muslim shops and residences, and reportedly, also on places of worship. Police, as in several previous incidents, were noticeably late to respond to the crisis. Later, STF was deployed to quell the unrest. Violence in Ampara is the latest in a sequel of previous attacks on Muslims and islamophobia propagated by bigots. Lackadaisical police and government response to past incidents have obviously emboldened fanatics. This time again, police have been blamed for negligence. The Prime Minister, in his capacity as the Law and Order Minister has appointed a committee to look into police oversight. So did his predecessor Sagala Ratnayake after the Aluthgama incident, in which also police were blamed for slow response. Nothing productive came out of that committee, and one can bet confidently there won’t be much difference this time as well. In other countries, when institutions blunder, as repeatedly as they do in Sri Lanka, there is someone to take the blame. Heads roll. Here, the IGP is busy organizing morning meditation sessions for cops. (He was caught on CCTV cameras assaulting a staffer for skipping the event). The absence of effective political or bureaucratic oversight in the system is fostering negligence. Until the officials of supervisory capacity are held accountable for their failures, police will come only after riots are over. Also, the government’s ‘tie-coat’ diplomacy has not worked. Fanatics lampoon the spineless approach of the government and exploit the vacuum. Those foreign funded multi-million dollar NGO activities to foster tolerance and ethnic amity, may have good intentions, but have produced little practical results. People should ask why this violent bigotry keeps happening. The simplest answer is that perpetrators of religious and ethnic hate know quite well that the cost they incur by causing this mayhem is very little. Most of the time in the past, violence has gone unpunished. The government should increase the retributive cost for perpetrating hate crime. The state and its security apparatus that defeated a determined terrorist group- perhaps two, if one counts the one in the South- have capacity to do so. What is lacking in is political will, and also perhaps a basic idea how grievous the threat would become, if left unchecked, let alone the damage it has already done to ethnic relations. The government should pass the proposed counter terrorism law that would allow adequate pre-trial detention and lengthy prison sentences for crimes that are intended to polarize the country ethnically. Crimes of this nature and perpetrators should be handled by the Terrorist Investigation Division. Military intelligence can be assigned to monitor these groups. When the government continues to bungle, these groups will morph into something bigger, and one day, someone else will have to do the dirty work to clean an aggravated rot. Even if these hate groups remain a peripheral nuisance, they will still have a heavy toll on ethnic harmony. The last thing Sri Lanka wants right now is another ethnic schism, this time between the Sinhalese and Muslims. These bigots would make that happen. Even if all the above does not make sense for the government, at least there is one last thing that it should be worried. The government’s half –hearted response towards bigotry is driving away minority voters. Disappointment of these voters, and a large swath of moderates of all communities who did not turn up to vote was partly a reason for the government’s poor performance at the recent local government election. At least now, the government should do something before it is too late for it, and for the country. Its better to appoint Sarath Fonseka as Minister of Law and Order so that IGP and other DIGs will resign. This would give the Government a chance to appoint honest hard working officers to these posts.